Spanish Real Estate Crisis - A Crash or some Adjustments? With so much talk about bubbles bursting, plus speculation about crashes and soft landings, what the implications of having bubble and is it likely to burst or simply deflate? By "bubble" we mean that something has been inflated artificially. In this case causing an excess of supply over demand. If this bubble bursts there will be a crash. If it deflates slowly we have a soft landing. Is there a Spanish Property Bubble? So what caused the Bubble? There is no bubble if property prices high because the are driven by an excess of demand over supply. The is a real bubble if the price of property does not reflect the true demand and the demand is driven by temporary factors that could disappear. It takes several years to plan and build properties and this encourages bubbles. 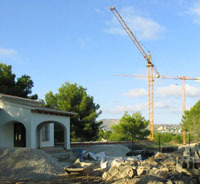 More new properties have been started in the past few years than in any other European country. Investors have come to view Spanish property as risk free way to make money. Underestimating the risk is often how bubbles start. In a survey started in February 2006, in which 876 were polled, 72% opined that a bubble existed and 28% thought property is reasonably priced. English results were 66%/34% and Spanish 91%/9%. The United Nations dispatched a special envoy on adequate housing to report on the Spanish situation. Some of this makes astonishing reading. Either read the report or just take my word for it. There is a very serious excess of supply over demand and prices have become unaffordable. So, Yes - there definitely is a Bubble! So what caused the Spanish Property Bubble? The recent boom, which started in 2000, was driven primarily by UK buyers of second homes in the sun attracted by Mediterranean lifestyles and the possibility of short- or medium-term profits. Property purchases were funded by loans raised against the increasing equity of their UK homes (due to the property boom in UK) and/or low-interest Spanish bank loans against the foreign property. Property value increases were so steep that short-term off-plan investments were viable. The Spanish domestic market was also caught up in the boom with what seems like an endless flow of cheap money and variable-rate new mortgages of 3.25% to 3.5%. "Speculation and the benefits generated by housing have led to wide scale corruption." "... scandals, such as the one in Marbella, constitute only the tip of the iceberg." " ... welcomes the nomination of the Special Prosecutors to look into these practices". There were spectacular rises in real estate values, both new and resale, and many short-term speculators bought off-plan. The upward spiral continued and developers planned and started more and more future projects fuelled by early sales of existing ones until 2006 when 600,000 new units were started. However, prices in established areas (such as Costa de Sol, Almeria and Costa Blanca) levelled out and started to fall - probably because of increasing supply in new areas. Whilst this was happening Spanish real estate began to suffer strong competition from emerging and recovering markets such as Turkey, Bulgaria, Croatia and Florida. Coupled with that the British press gave Spanish real estate a hammering over land grab and corruption scandals. More recently there have been reports about a Spanish property crash. Although there is still a lot of interest, buyers seem hesitant (or perhaps cautious). If they are waiting for prices to fall - then that is exactly what must happen! Also during this period warning bells were sounding for the UK economy and it was feared that consumer over-confidence would cause runaway inflation. The main problem here as well was unacceptable increases in house prices which the Bank of England tried to control by increases in the bank rate. It needs to be understood that Spain and UK have a completely different set of issues. The UK has an acute housing shortage and a small land bank. Until a million new, reasonably-priced houses can be started, which will probably never happen, house prices have to be stifled. Spain, on the other hand, has a huge potential land bank and the recent boom has already cause a serious glut. Recent events in UK have further aggravated the problem. Although 6% was still the smallest rise since 1995, it was predicted that the B of E would soon have to increase the base rate. On Aug 3rd the B of E increased the rate by 1/4 point to 4.75% and the Central European Bank increased to 3%. The B of E further stated that another increase would be considered for November. The reason given was to bring inflation back to the 2% target. The B of E and the government is attempting to keep house price increases in the 4% - 5% range and inflation to 2% in order to avoid the kind of crash that happened in the 90's. It is as well to remember that Spanish real estate values collapsed at the same time. Spain's major industries are tourism and construction and the UK is the biggest client. For the most of the past three decades these have provided the backbone for healthy development and full employment. Spanish tourism also has a serious problem. Spanish real estate agents are predicting a "soft landing" and, as far as they are concerned, that is probably what will happen. The reason is that most have portfolios of both resale and new property. There is also a lot of talk about "adjustments" and clearly this is what will have to happen. By "adjustments" they mean that sellers have to reduce prices. The resale market is not such a problem because generally the sellers will simply have to forgo expected profits or remove the property from sale. Developers are the more vulnerable and for most there are difficult times ahead. They have borrowed heavily to fund what seemed to be an endless demand and are now facing interest increases and dwindling sales. They have also borrowed heavily to ensure the availability of future developments. Many have paid inflated prices for building land. Most of them have not generated enough capital to sit it out neither can they afford to reduce prices sufficiently to compete with the devaluing resale market. Spanish real estate long-term has been a solid, enjoyable investment. Right now "long-term" is the only logical what to look at it. Whatever you like to call it "Crash" or "Soft Landing" - the "Boom" is well and truly over!. See my follow on article Spanish Real Estate - The Future.